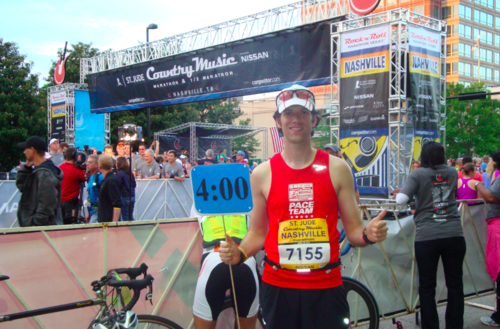 My Run: Overall, the Country Music Marathon (CMM) was my 12th full marathon, but this one was quite a bit different than any of my previous 11. For this race I had applied for and was accepted to be the official 4-hour pace team leader for the race. This was something I have wanted to do ever since my first marathon which I completed with the help of a pace team (Chicago 2009). With a marathon PR of 3:12:28 back in March (NOLA), I had quite a bit of uncertainty about what running a 4-hour marathon at the CMM would be like. Part of me hoped it would be like a long, slow, training run and that maybe I would be able to enjoy a marathon for a change. Another part of me wondered how well I was going to deal with being on my feet for almost 4-hours in the aerobic heart-rate zone when I had never done a run this long before (by time). All week, the forecast called for very warm conditions with lows near 70 and highs in the mid-80s. With the timing of this race it seems like we always have either storms or hot conditions. These warm conditions along with coming down with a head-cold on Friday just added to my uncertainty concerning the race. My pacing strategy was to maintain a consistent effort throughout the race instead of trying to stay locked in to one specific pace regardless of terrain. The CMM course is very hilly, especially in first 8 miles, and I knew that if I didn’t slow down going up the hills I would begin losing people early in the race. My overall goal was to finish the race between 3:59:00 and 3:59:59 so that anyone running with me who had a goal to break 4-hours would not be disappointed. As we started I would estimate there were 30 or so people running with me, who had introduced themselves. Most of them had questions about my pacing strategy or how I would handle water stops, and it was a lot of fun talking to them before the race. One particular gentleman named Paul really stood out. He had talked to me extensively at the expo on Thursday and was there ready to go on Saturday morning in corral 7. We had a lot of good conversation throughout the race. From the outset I knew the heat would be a problem and I encouraged everyone in our group to begin taking in fluid from the first aid station, even if they weren’t thirsty. According to plan, we ran the downhill and flat portions at or below 4-hour goal pace (9:09) and the uphill portions were a bit slower. Through most of the first 8 miles we carried a 30 to 45-second deficit with regard to goal pace, but this was right in line with what I wanted through the hilly sections. Beginning in mile-9 we began to make up some time through the downhill sections and the group seemed to be relieved when we broke off from the half-marathon participants during mile-11. Up until that point the course had been pretty congested, but it thinned out a LOT after the split. When we reached the half-way point in Metro Center, we were 15-seconds ahead of 4-hour pace, and I would estimate that 20 of the 30 who started with me were still in the group. During the second half of the race I could tell that the heat was really beginning to bother some of the runners in the group and I tried to offer constant encouragement and motivation to try and keep their minds from dwelling on their discomfort. Most everyone stayed with me through the big hill coming out of Metro Center in Mile 14 and the incline up James Robertson Parkway during Mile 17. That mile is the only one in the whole race where I was upset about my pace because I subconsciously pushed it up to 8:49, even though most of it was uphill. Once we turned onto Woodland Street I tried to give everyone a chance to chill while we had a bit of a downhill stretch. At the bottom of that hill was where the full course passed the finish line (and we could see half marathoners finishing), and I have a feeling this was a big mental hurdle for many of the runners in my group. The heat was becoming really difficult, we had a long gradual uphill for most of mile-18, and we had just passed the finish line but had over 9 miles to go. At this point I would estimate there were still 15 or so in my group, but they started dropping like flies in East Nashville. Whenever I saw spectators I begged them to offer up cheers for the 4-hour group, desperately trying to keep everyone motivated. During mile-20 I lost two of the runners who I had previously thought would make it all the way, and I began to wonder if anyone would finish with me. On Davidson Road headed toward Shelby Park, my group was down to 6 or 7 very tired runners and Paul who still seemed pretty fresh. We finally got some shade in Shelby Park and I tried to keep encouraging everyone. As we finished the loop in Shelby and started mile-25, my group was down to 4 (including Paul), and I could tell they still had some gas in the tank because they started pushing the pace. All of them surged ahead and ultimately finished ahead of me well under 4-hours. For my remaining two miles I tried to pick up other runners who were fading and encourage them to finish with me. 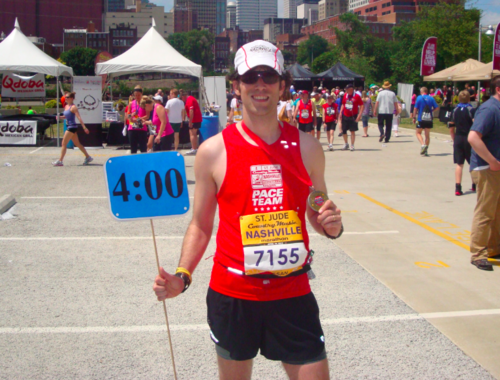 I crossed the finish line in 3:59:11, which was exactly what I was shooting for. The first runner that I saw was Paul who came back to say thank you and I was very happy that he hung around for a minute. He had set a new PR of 3:57 (on a tough course in brutal conditions), and I was extremely proud of him. It was very rewarding to know that I had helped at least one person exceed their goal and even set a new PR. 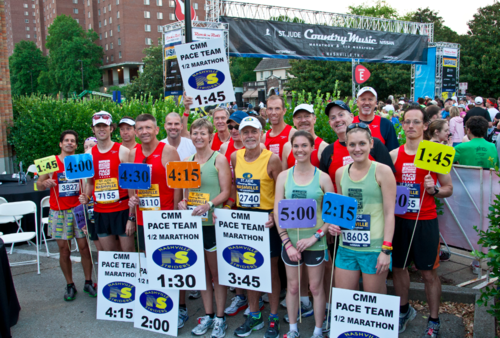 I’m sure there are others who benefitted from the pace group, but I’ll likely never know how most of them finished up. As for me, I felt fantastic throughout the race. I got tired and I was hot, but my legs felt great. I kept expecting to hit some sort of aerobic wall or have some type of significant discomfort, but it never happened. Also, I’ve never really been intrigued by running an ultramarathon, but I’m pretty confident at that pace I could have run several more miles, even in the warm conditions. As for my pre-race uncertainties, it turned out to be much more like a training run than a race, and I enjoyed every minute of it! One interesting thing is that my head-cold has only gotten worse since the race, and the best I felt all weekend was the 4-hours I was on the course running. Overall this was an extremely gratifying experience, and one that I hope I can do again in the future. Big Congrats to my friend Aine (2nd from left) for running a 3:37 – BQ (Boston Qualifier) in tough conditions, in only her 2nd full marathon! Impressive! Also want to give a big shout-out to Bob and Kelly Murphy for passing out ice cubes to the runners in the latter miles of the race. It was a very hot day and those ice cubes felt awesome. The Race: This race is part of the Rock n’ Roll series run by The Competitor Group and has approximately 32,000 participants in the half & the full. The first half of the course is extremely well designed and interesting and the second half is more like an after-though (which is consistent for most Rock n’ Roll events – see more below). All full and half marathon participants received an Brooks technical t-shirt (very high quality). 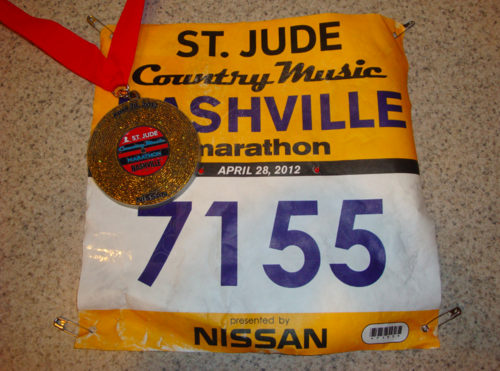 Though most Rock n’ Roll events have great finisher’s medals, this one was pretty dull in my opinion. There were 20+ aid stations with water and about half of them also had Gatorade. I know some runners were disappointed that they are dropping the number of aid stations with sports drink, but it is not a big deal for me since I prefer Gu + Water. Like most big races, the water and Gatorade were in different cups, making it easy to distinguish. 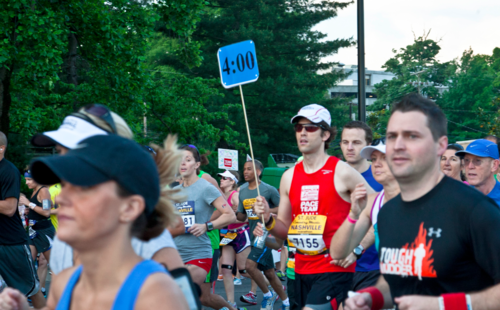 The mile markers were elevated, making them easy to see, and all included split times. The finish area is much better than previous years (less congestion) after the course re-design in 2011. As for post-race food and refreshments, they had towels soaked in ice-water, energy bars, fruit, cookies, chocolate milk, Gatorade, water, etc. Also this year they had several spots where they were spraying water on the runners at aid stations which is nice in hot conditions. Because I was on the pace team, I had access to the VIP area before and after the race which was NICE! No lines at the port-o-potties, VIP gear check, and lots of food and drinks. The fact that the weekend includes a kid’s race and a half marathon, makes it a great event for the whole family. 1.) Pre-Race / Kid’s Race Logistics – Since this is a point to point race, you have to park at the finish (LP Field) and take a shuttle to the start. I got to LP field at 5am (2-hours before the race) and the line to get on the bus went all the way from Woodland Street (North of LP Field) to the South end of LP Field. I barely made it to my pace-team meeting at 6am. Also for the Kid’s marathon the night before, my daughter ran her final mile at 5:15pm and was finished by 5:30pm. However due to parking and traffic we did not get home until after 8pm. All of this is very frustrating in the middle of what is otherwise a pretty well organized race. 2.) 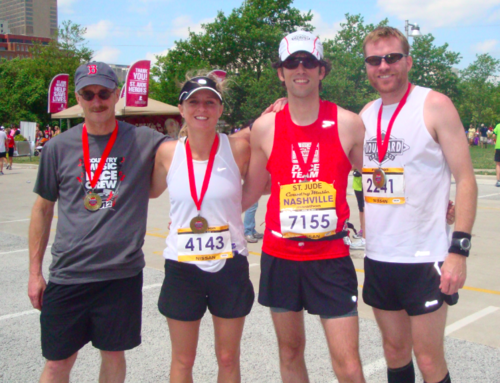 Second-Half of the Full Marathon Course – Rock n’ Roll events are notorious for having full marathon courses where the 2nd half is extremely dull. Nashville is no different. I understand that Competitor group makes most of their money on the half, but a little effort for the 2nd half of the full course would be appreciated. I still have no idea why the Nashville course goes through Metro Center, when there are so many other interesting sections of the city available. 3.) Timing of the Race – One thing that I don’t understand is the timing of the race. By having it in Nashville in April, there is a very high likelihood that it will either be really hot/humid or stormy. This has been a consistent problem throughout the history of the race. The Course: The course is hilly, especially in the first half, and is even more difficult after the changes they made in 2011. There are moderate hills throughout the course and two really significant hill at mile 3 coming up Demonbreun and at mile 14 coming out of Metro Center. The last 1.2-miles contain two pretty good hills, but the last half mile or so is mostly downhill to the finish. The first half of the course is awesome. It starts next to Centennial Park (home of the Parthenon) and includes downtown Nashville, Music Row, and the beautiful Belmont Road and Granny White areas. The second half is pretty dull, and includes Metro Center and parts of East Nashville, including Woodland Street, Five Points, Russell Street, South Fifth, and Shelby Park. There is also very little crowd support on the second half, and there are long sections that are completely exposed to the sun and wind.